Amber is now offering adult dog training classes. “Continuing Education” takes the skills the dog already knows and adds distraction, distance, and duration. 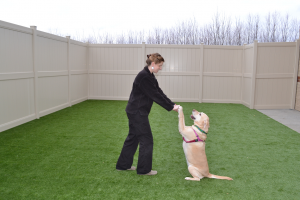 This class is the next step for any puppy working their way through our puppy program or the newly acquired adult dog looking to begin or enhance their life skills. For puppies enrolled in our puppy program, there are no age restrictions to join this class. For any dog not enrolled in our puppy program, the dog must be 1 year+ to join class. Please call us to find out more information or to set up a session.